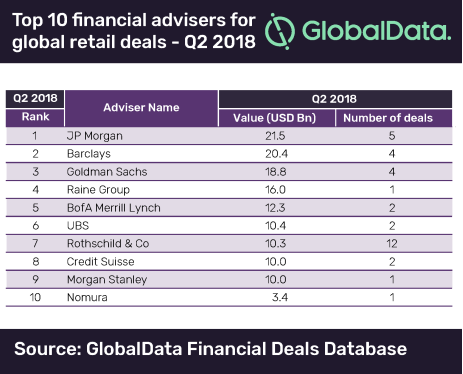 JP Morgan has topped the latest M&A league table of the top 10 financial advisers for the retail industry for Q2 2018, compiled by leading data analytics company GlobalData. The bank led the competition by deal value, with five deals worth a combined $21.5bn, including the industry’s highest value deal – Walmart’s proposed acquisition of a 77% Stake in Flipkart for $16bn. According to GlobalData, which uses its tracking of all merger and acquisition, private equity/venture capital and asset transaction activity around the world to compile the league table, Barclays and Goldman Sachs were the remaining two advisers among the top three with $20.4bn and $18.8bn, respectively. The Retail sector saw low value deals during the second quarter of 2018 when compared to the same quarter in the previous year. The overall value declined by 34.7% to $37.3bn in Q2 2018 from $57.1bn in Q2 2017. On the contrary, volumes saw a 34.4% growth, from 366 to 492 during the quarters in review. 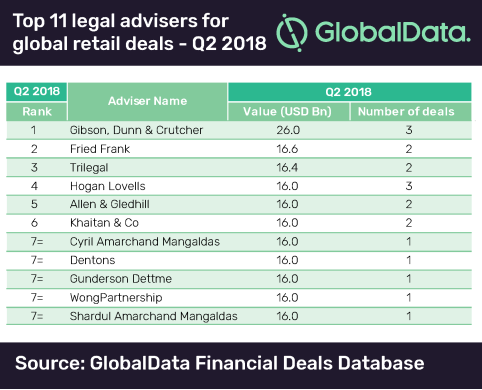 Interestingly, Morgan Stanley, which stood ninth in the retail league table of M&A financial advisers, led the competition in the global league table of top 20 M&A financial advisers released by GlobalData recently. The retail league table’s top ranked JP Morgan stood third in global rankings, next to Goldman Sachs. US-based Gibson, Dunn & Crutcher topped the list of the top 11 legal advisers by value and shared the position with Hogal Lovells by volume. Gibson, Dunn & Crutcher advised on three deals worth $26bn. All the top ranked advisers in the league table were associated with the Walmart-Flipkart deal during the quarter. The last five advisers of the table shared the seventh rank as they only advised on this deal.